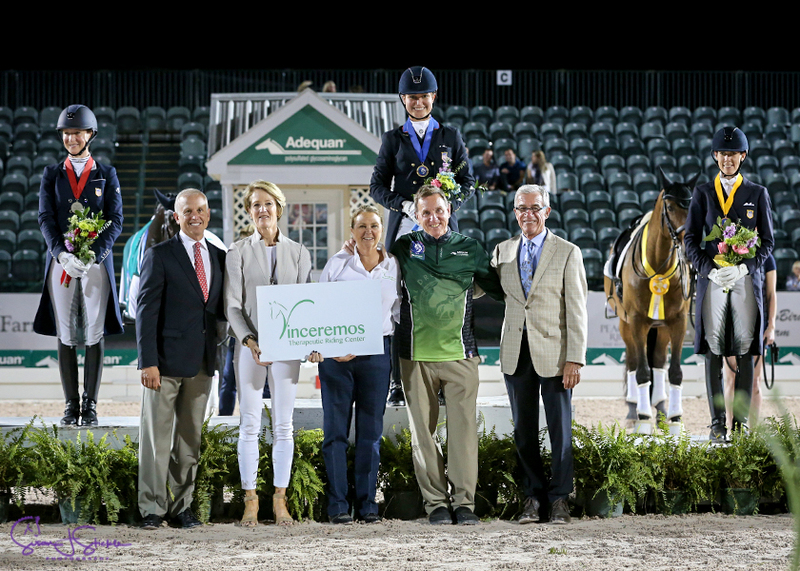 Home rider Adrienne Lyle takes gold on Betsy Juliano’s 11-year-old stallion Salvino with over 81% in the Nations Cup Grand Prix Freestyle CDIO3*, presented by Vinceremos Therapeutic Riding Center. Click to watch Adrienne and Salvino! Medalists Adrienne Lyle, Sabine Schut-Kery and Olivia LaGoy-Weltz with US Equestrian President Murray Kessler, Arlene ‘Tuny’ Page, Ruth Menor, Allyn Mann of Adequan® and judge Gary Rockwell. In only their second CDI grand prix freestyle test, Sabine Schut-Kery and 12-year-old Sanceo (by San Remo) pull off a tremendous performance to take silver with 78.145%. Olivia La-Goy Weltz, the bronze medal winner, rode her horse Lonoir in this same Nations Cup freestyle competition at AGDF last year but had a tough round and scored 68.8%. This year they had no such issues, upping their score by around 9%. 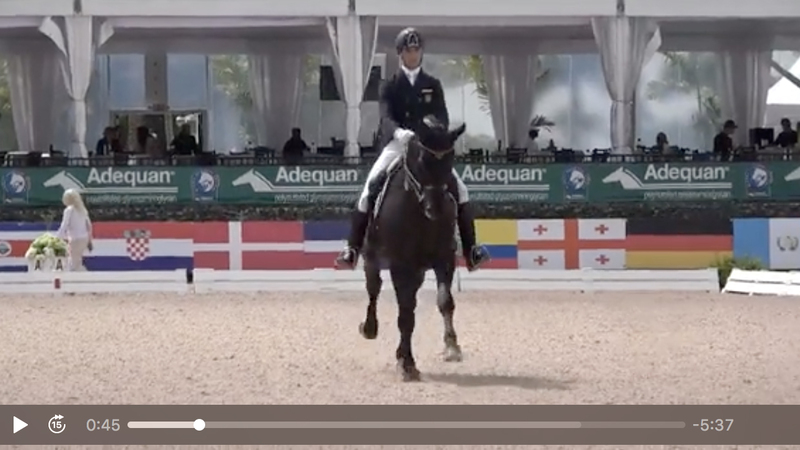 Olivia LaGoy-Weltz and Lonoir improve their score from the 2017 Nations Cup freestyle by 9%, nailing an impressive fault-free performance for 77.385% and the bronze medal. Pablo Gomez Molina (ESP) and Yeguada de Ymas’s Furst Fiorano Ymas are undefeated in week 12 of AGDF, taking the small tour Nations Cup freestyle gold. Click to watch Pablo and Furst Fiorano Ymas! Pablo Gomez Molina on the winning podium, joined by Ruth Menor, Pablo Carrillo-Solis, Jesse Fleming, Sunbenz Charles, and Susan Guinan of Vinceremos Therapeutic Riding Center, Allyn Mann of Adequan®, and judge Stephen Clarke. Juan Matute Guimon (ESP) caps an epic Wellington season of 25 tests over the 12 AGDF weeks, culminating in winning his last three on Don Diego Ymas and scooping triple under-25 Nations Cup gold. Click to watch Juan and Don Diego Ymas! Action in week 12 of the 2018 AGDF — the final week of the circuit — concludes on Saturday, March 31. The final day boasts nine CDI classes, ranging from ponies and young horses to the Grand Prix Special CDI3*, presented by Grand Prix Services. For more information and results, visit www.globaldressagefestival.com. 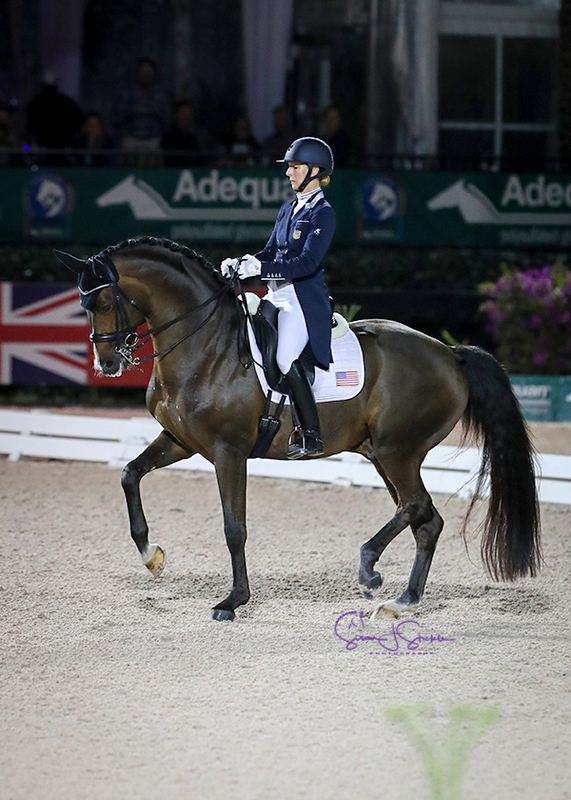 Adrienne Lyle (USA) on Salvino, Elizabeth Juliano’s 11yo Hanoverian stallion by Sandro Hit x Donnerhall: 83.275, 83.475, 81.175, 79.6, 81.225, 81.75%. 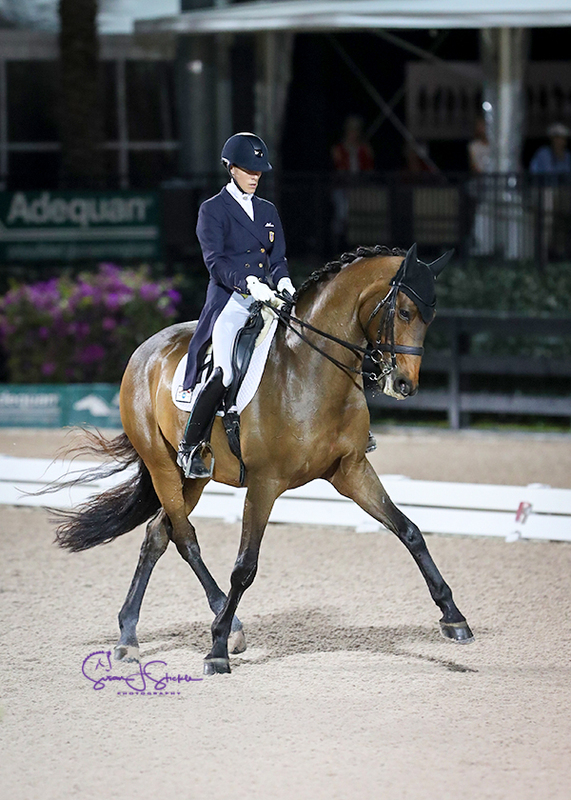 Sabine Schut-Kery (USA) on Sanceo, Alice Womble’s 12yo Hanoverian stallion by San Remo x Ramiro’s Son: 81.875, 76.525, 76.775, 77.15, 78.4, 78.145%. Olivia LaGoy-Weltz (USA) on Lonoir, her own 14yo Danish warmblood gelding by De Noir x Loran: 77.075, 78.925, 75.175, 76.825, 78.925, 77.385%. Brittany Fraser (CAN) on All In, her own 13yo KWPN gelding by Tango x Damiro: 77.475, 77.525, 75.725, 77.15, 77.075, 76.99%. Ashley Holzer (USA) on Havanna 145, Diane Fellows’ 11yo Hanoverian mare by Hochadel x Rodgau:475, 74.675, 73.925, 70.975, 76.05, 73.82%. Jill Irving (CAN) on Degas 12, her own 16yo Hanoverian by De Niro x Regazzoni: 70.375, 72.35, 72.6, 69.975, 72.35, 71.53%. Kim Gentry (AUS) on Leonardo, her own 11yo Danish warmblood by Landtinus x Rambo: 65.925, 66.5, 67.375, 65.85, 65.725, 66.275%. Diane Creech (CAN) on Chrevis Christo, Louise Leatherdale’s 10yo Danish warmblood gelding by Chrevi’s La Vi x Natador: 61.25, 67.475, 68.9, 66.475, 62.525, 65.325%. Pablo Gomez Molina (ESP) on Furst Fiorano Ymas, Yeguada de Ymas’s 11yo Westfalian gelding by First Piccolo x Donnerbube I: 71.875, 73.75, 74.125, 72.375, 69.5, 72.325%. Kelly Layne (AUS) on Furst Amante, her own 12yo Rheinelander gelding by First Piccolo x Hitchcock: 69, 72.375, 70.375, 71.125, 68.5, 70.275%. Nicholas Fyffe (AUS) on Hitchcock, Louise Cote’s 14yo Hanoverian gelding by His Highness x Don Primero: 68.75, 70.25, 69, 68.375, 65.75, 68.425%. 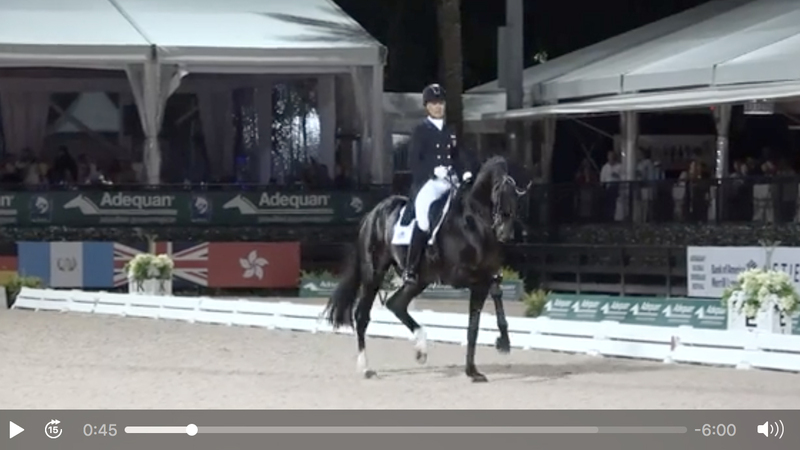 Marta Renilla (ESP) on Rhustler, her own 9yo Hanoverian gelding by Rousseau x Royal Prince: 68.25, 67.375, 67.5, 67.875, 63.375, 66.875%. Raul Corchuelo (COL) on Senorita 43, Scott Redwantz’s 8yo Oldenburg mare by Sandro Hit x Wolkentanz II: 64.125, 63.625, 64, 66, 64, 64.35%. 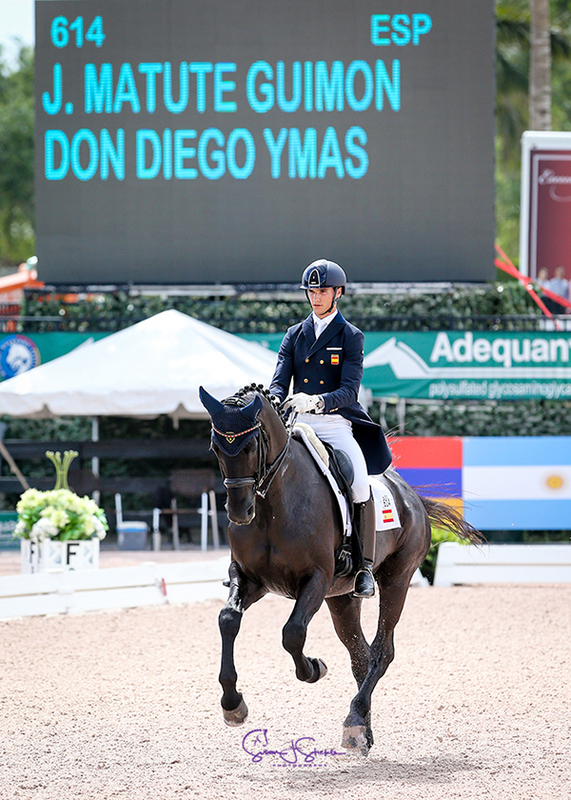 Juan Matute Guimon (ESP) on Don Diego Ymas, Juan F Matute’s 15yo Hanoverian gelding by Don Frederico x Wolkenstein II: 73.625, 78.75, 74, 75.458%. Kerrigan Gluch (USA) on Bolero CXLVIII, Hampton Green Farm’s 14yo PRE stallion by Utrerano VII x Urano II: 72.5, 71, 69, 70.833%. 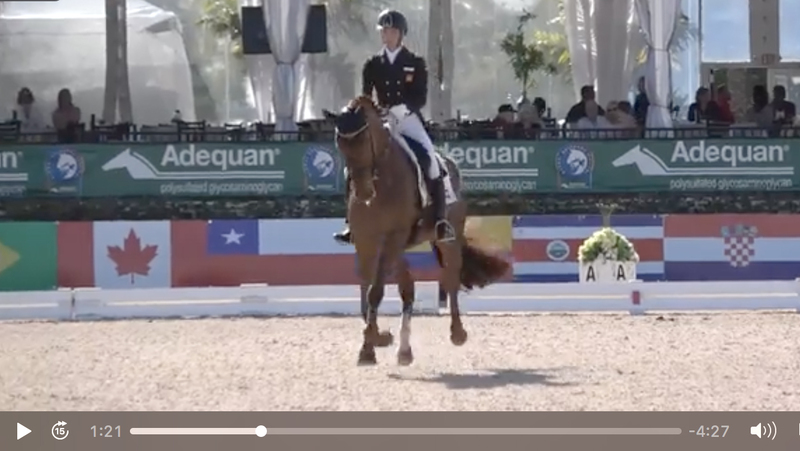 Rodrigo Encinas Fuentes (ESP) on Van The Man, Cesar Parra’s 16yo Danish warmblood gelding by Obelisk x Fruhling: 69.875, 71.375, 69.375, 70.208%. 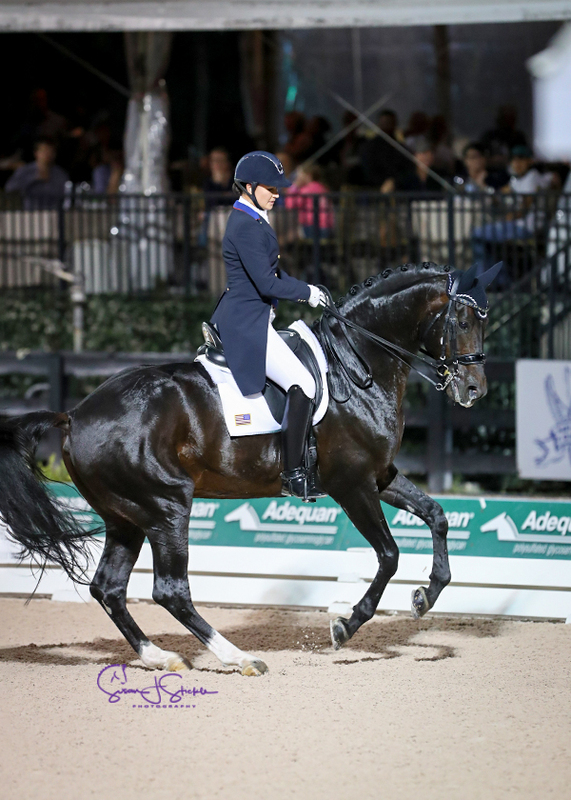 Natalie Pai (USA) on Unlimited, Melanie Pai’s 17yo KWPN gelding by Jazz x Winckenburgh: 69.75, 69.125, 68.625, 69.167%. Naima Moreira Laliberté (CAN) on I Do Kiss, KML s.a.r.l. 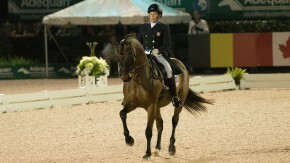 & Naima Moreira Laliberté’s 12yo Swedish warmblood stallion by French Kiss x Donnerfly: 68.5, 70.375, 65.625, 68.167%. Molly Paris (USA) on Countess, her own 16yo Danish warmblood mare by Don x Solos Carex: 70.25, 67.375, 63.875%, 67.167%. Laurence Blais Tetreault (CAN) on Utah, Mathilde Blais Tetreault’s 17yo KWPN gelding by Jazz x Landwind II B: 65.25, 69.25, 64.625, 66.375%. Tanya Strasser-Shostak (CAN) on Renaissance Tyme, Evi Strasser’s 15yo Oldenburg gelding by Royal Diamond x Dream Of Heidelberg: 61, 68.25, 61.75, 63.667%.